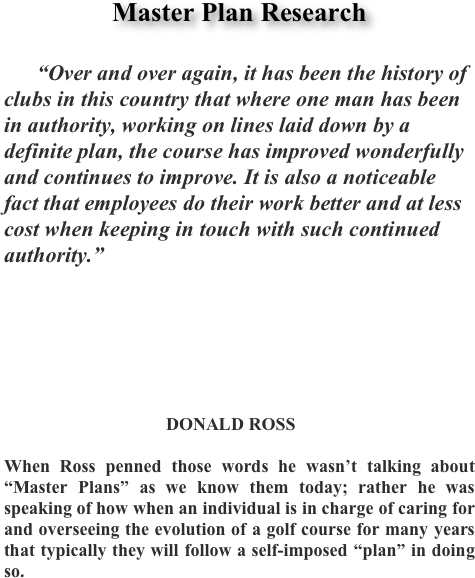 When Ross penned those words he wasn’t talking about “Master Plans” as we know them today; rather he was speaking of how when an individual is in charge of caring for and overseeing the evolution of a golf course for many years that typically they will follow a self-imposed “plan” in doing so. Today, most clubs depend upon a “Green Committee” who report to the Club’s Board of Directors to advise on how to care for the course, and more importantly, what changes to make to the course itself that will better enable the Board to keep up with the changing abilities of the membership to play and enjoy it. That is why most clubs are now preparing, if they haven’t done so already, exactly what Ross wrote about back then without even realizing it, Master Plans that will enable these Boards and Committees to have a clear guideline as to how to go about caring for this responsibility now and into the future. The wisdom in this can be seen in that it is the rarest of Clubs where a practicing golf course architect is both member and involved in these activities. No, usually those who carry out this responsibility learn as they go. Although they may learn much, often they don’t learn enough; after all, understanding how to maintain a golf course in its original configuration is far different than having an understanding why the configuration -- how it was routed, where the hazards were placed, the shape and contours of the putting greens, etc… -- was created the way it was by the original architect. It is questions regarding these very features that serve as the source of the most dramatic and expensive changes made to the course through the years, all of which are borne by the members themselves. So how does having a “Master Plan” aid a Board or Committee in caring for its golf course? By addressing those types of questions and others yet to be proposed. In a sense it needs to see far into the future while also being able to gaze back into the past and the beginnings of the club itself. 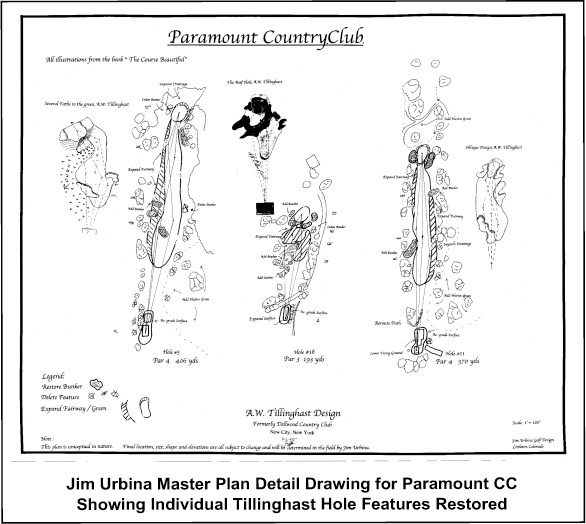 Most members at a Club see the drawing produced which details the course changes as the “Master Plan.” Actually the Plan itself should be much greater in scope. Instead of simply a drawing that states, move X tee box back and left 30 yards on Hole Y, an accompanying document should explain that the REASON for moving the tee box on hole Y is to restore the angle of play, or maybe to enable the hole to be played in the manner originally planned, or a number of other equally valid reasons. Sometimes it might also be that a hole needs changing due to a local issue such as a road no impacting a course forcing a change. Regardless of the reason or change proposed, what is most important is for the work to be planned and carried out in a manner that honors both the original architect’s intent and within the framework of his design philosophies. Note the example below. 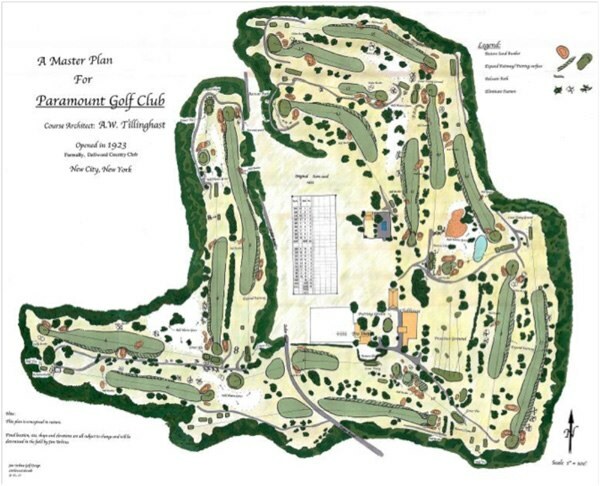 This is a portion of the Master Plan recently done for and now being carried out by the Paramount Country Club located in New City, New York. over exactly what these “design philosophies” were and how they should be implemented. Let me give you an example. Several years back a Golden Age golf club whose course was designed by one of the great architects in the history of the day, found itself engaging in a debate over the subject that often times is the most contentious of them all at a golf club… tree removal. One large “faction” was determined that numerous trees planted in memory of long-past family and club members would remain no matter what and they cited writings of the architect on the importance of beautiful trees on a golf course and why they should be found there. Meanwhile, another member “faction,” one just as large and determined, and whose concern was over the viability of golf course turf was demanding that trees be cut down on mass to allow for more sunlight and to eliminate morning and afternoon shade. The proof they offered to back up their demand? The writings of the same architect! In this case the problem was solved by providing the Club with a COMPLETE report that detailed every aspects of what this specific architect believed when it came to having trees on a golf course. Where they should be, how they should impact a specific hole design, what ones to preserve as “specimen trees,” where they should not be planted or cut down and much more information. Today that club is carrying out a long-term tree program based upon this report which was incorporated into the “Master Plan” designed for them by the architect they chose to advise them. Instead of contentious arguing with each “side” quoting the architect as proof, they now find themselves playing a renewed golf course that is once again vibrant and filled with challenging angles of play that haven’t been seen for many years and doing so with a clear and proper understanding of how the architect envisioned the course to be. •How the course was originally designed, including all of its features, and WHY. •The design philosophy that the architect believed in and put into practice on their course in style and specific features. •A brief evolution history of the changes made to the course through the years so that there may be an understanding of how the course came to be what it is today. Often this information becomes self-explanatory to questions involved with why specific recommendations are made in the “Plan” itself. •An understanding of why the specific course has an important place in the history of the game and the community itself, whether that be on a local or greater stage. If you are contemplating the creation of a “Master Plan” for your course or have already hired an architect to create one for you, Golden Age Research can aid you in this. We can provide the research services that will enable both you as the Club and the architect you have chosen to create a TRUE Master Plan that will enable your golf course to excite and inspire while also being true to its grand heritage. Please feel free to ask for a copy of our brochure “Master Research for a Master Plan.” We’d be delighted to send you a copy.